Well, I’ve gone and done it now. I’ve signed up for London’s MCM Comic Con this May, so where the hell are all those new pages I was meant to have? ‘In progress’ is a frustrating label to tack on I know but it’s the best way I can describe it, they’re coming together but I’ve had to run through a veritable factory of brick walls to get there. Hard brick walls, covered with rusty nails and that delightful black paint you can’t seem to wash off. The name of this factory? Action. 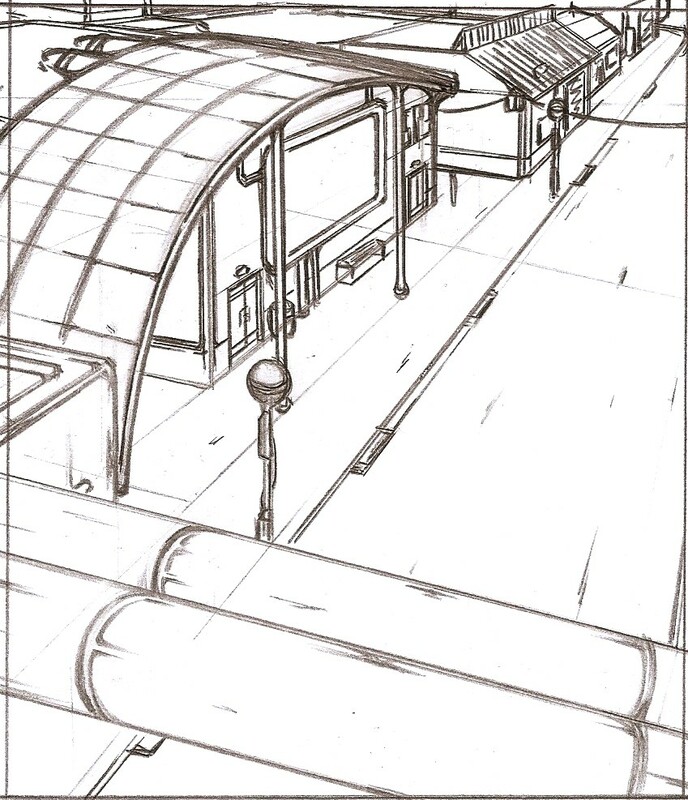 To clarify I’ve had plenty of other stuff keeping me busy too – which all being well should appear online eventually – but for the most part there’s no avoiding the fact I have almost no experience in planning or drawing a proper action sequence in a comic. I’ve had bursts of violence and quick motion before but they’ve generally been ancillary to the scenes they’re in rather than the focus. The anatomy, the faces, the wasted space in the layout… Can we just launch it into the sun and stop talking about it forever? Suffice to say I had a lot to learn back then and the whole endeavour left a foul taste in my mouth that likely put me off trying anything similar for a long time. 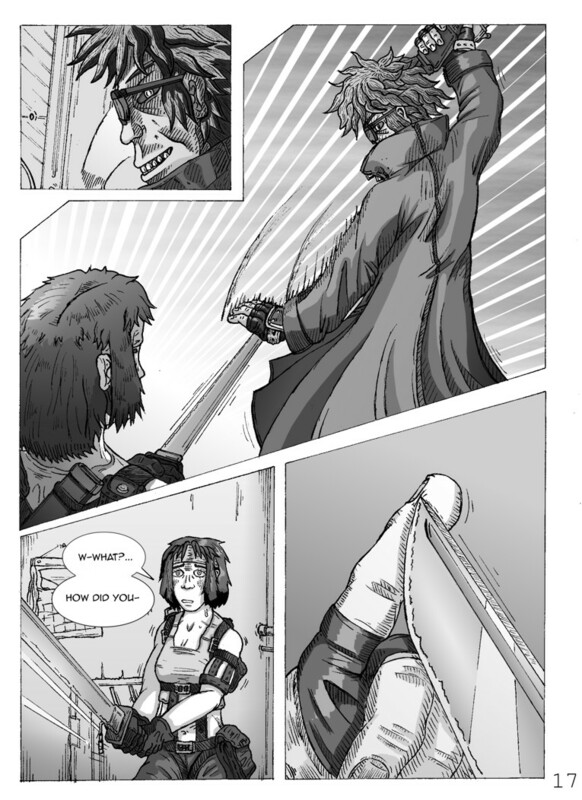 Still here I am again, facing a similar set of problems; my drawing’s certainly improved and actually having a script this time has helped but learning to draw action from Scratch (pun intended) has proved a challenging process. Here we have the bare bones of Scratch someone delivering an elbow thrust. I roughed it out, looked at it and wondered what was wrong with the picture when the obvious struck me; there is no thrust. Indeed no motion at all, this isn’t a professional delivering a crushing neck strike it’s an exercise enthusiast having a gentle warm up. Argh. 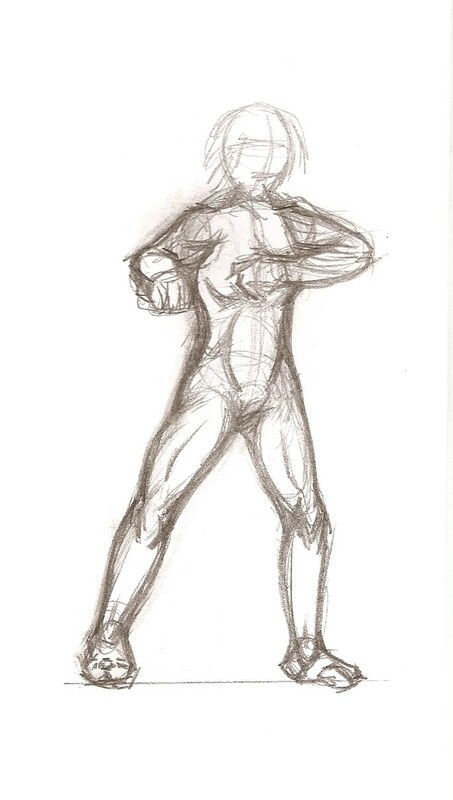 I’d literally got so wrapped up in the anatomy I’d neglected to think about the pose and how I might make it exciting. 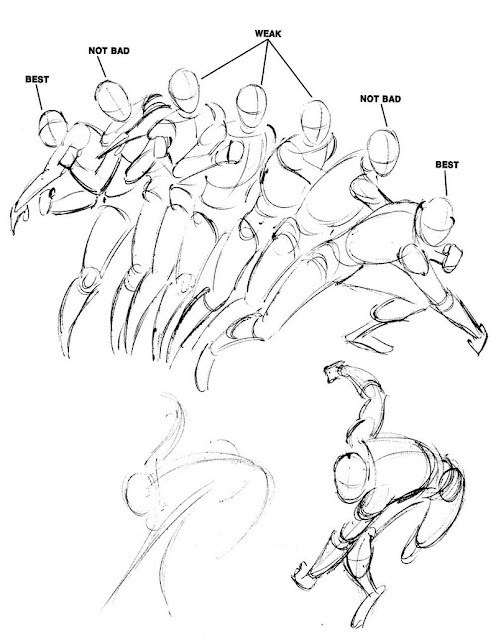 Conveniently it was at this point my memory fired up – for once – and I recalled a good bit of advice from How to Draw Comics The Marvel Way about exaggerating poses to emphasise motion. 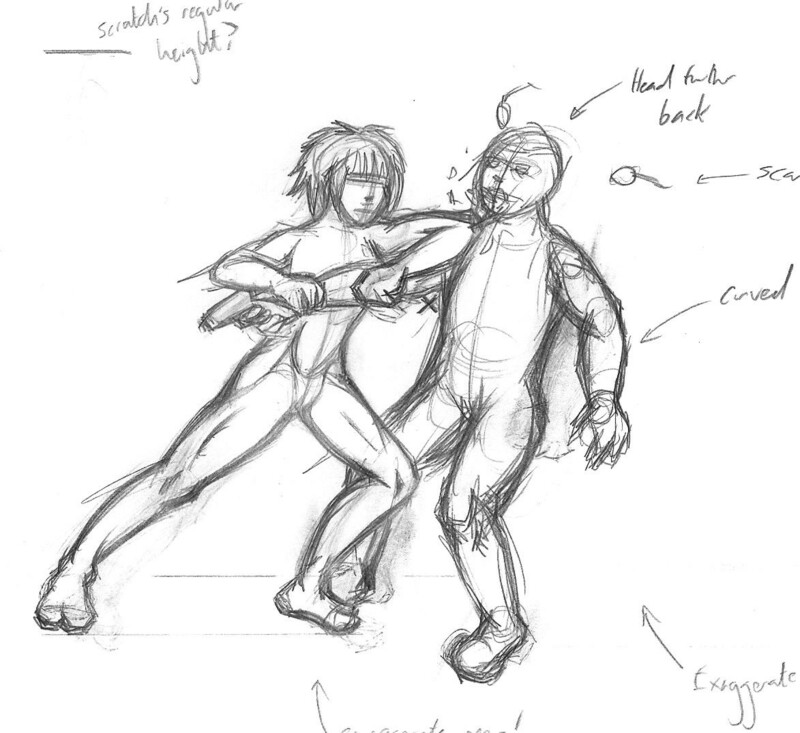 Better; the subjects legs are actually pushing them into the strike this time, with a general lean in the direction of movement and the arm extending further out suggesting actual force is being applied. 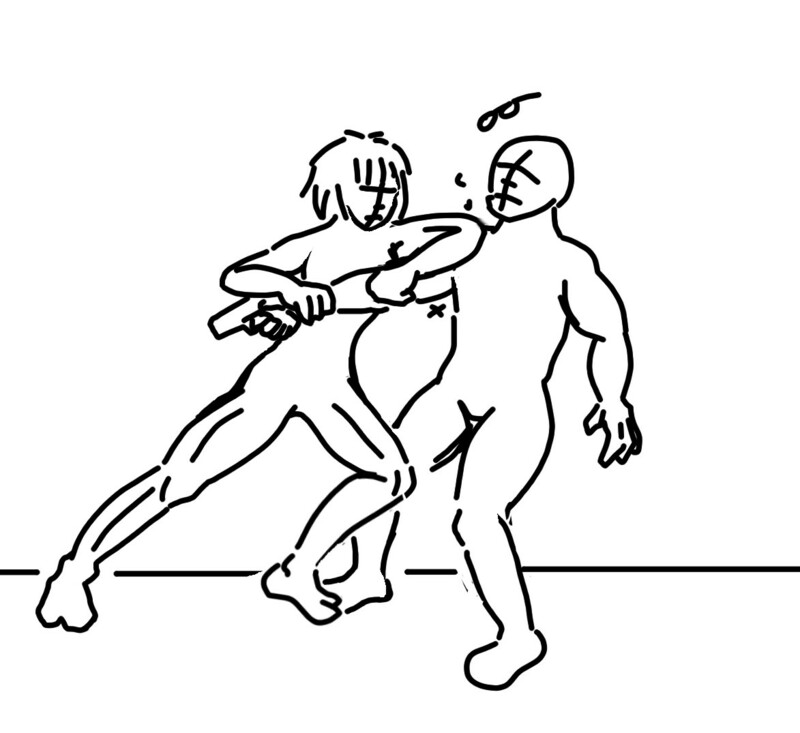 It remains far to stiff though, with the victim being altogether too upright for someone who’s just been struck in the chin full force, while knees should be bent much further in both cases if this is at the end of the motion. Much better. There’s a far stronger sense of engagement between characters here while Scratch’s the attacker’s front leg being bent further suggests a much longer run up and push into the strike. The victim’s head being knocked back further also emphasises the force of the impact more tangibly. 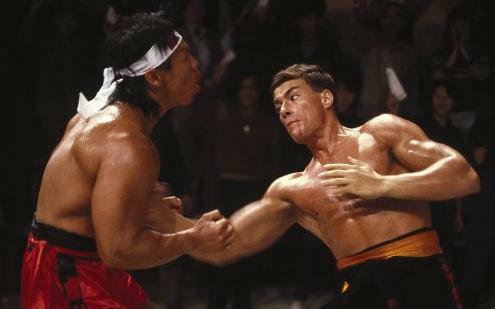 By exaggerating the key areas of the action – exertion and impact – the snapshot’s extreme qualities imply what preceded them – approach and attack – allowing the reader to fill the gaps without even realising it. We immediately know that it’s the end of a quick and likely powerful movement by the positioning of the aggressor’s arms and legs, while the victim’s reeling off-balance makes it clear that a painful strike has been made. 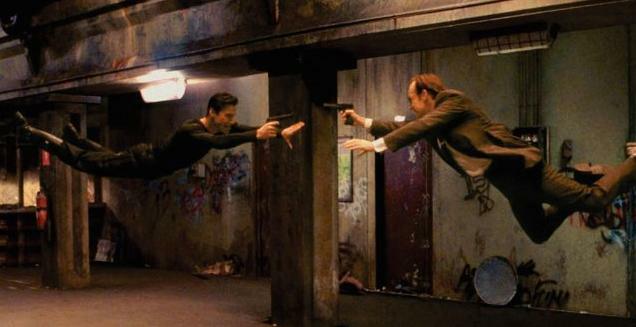 Unlike films and games comics can only imply an action since the reader is in control of acquisition; everything that goes in between the panels comes down to the mental images inspired by the real ones. The issue here is a broader one really and interconnects with much of what I’m learning and practicing in the medium as a whole, elbow strikes may not be subtle but the methods used to create genuine excitement and credibility are. 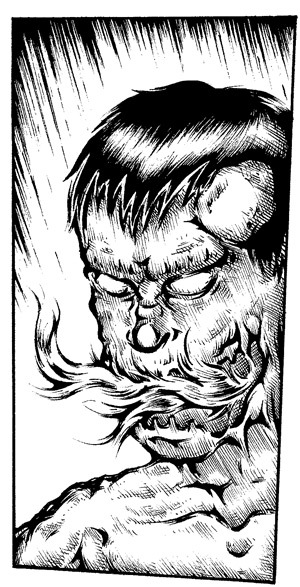 I’m still struggling a lot though the next page and those following it are closer to the right track now at least; I’ve set myself a tall order getting a new issue ready for the end of May but if I take some of that fighting spirit onboard maybe I can make it work after all. Just thought I’d quickly upload these rough sketches I did to test how Scratch might appear in different poses. Given that she’s one of the most physically active characters in the narrative (as it currently stands) it’s important that she looks right in action. Also, note the jacket in the right hand image, an addition I’m still working out – it needs to look suitably modern for a future setting but at the same time I don’t want it to appear frivolous, rather being sleek and utilitarian.